CBS Morning News story - Veterans Claim 3M earplugs caused hearing loss. 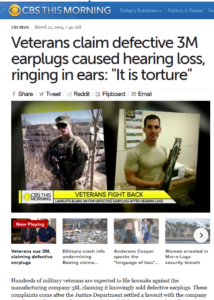 CBS News story – Veterans Claim 3M earplugs caused hearing loss. CBS News This Morning aired a segment on March 12, showing the alleged problem with 3M combat earplugs. As a law firm we’re glad this is making news because for months now we’ve been getting calls about this terrible situation. Many combat vets had no idea that they were in danger of losing their hearing from these 3M made combat earplugs, and why should they? When you’re given military equipment, you assume it’s the best that government money can buy right? However in this instance it’s not the case at all. Let’s dig into the controversy affecting so many men and women in our armed services. What’s the issue or problem with these 3M Combat ear plugs? Before the CBS news story hit, we had already heard from hundreds of veterans calling to discuss their legal rights to hold 3M Corporation accountable. If you are reading this and used 3M combat ear plugs and have hearing loss call us at 1-800-214-1010, we’d love to tell your story. Here’s the breakdown of what took place between 3M and the government. 3M ear plugs were used extensively between 2003 through 2015 or longer. These plugs were standard equipment for those that were deployed to combat service members sometime between 2003 and 2015. Other service branches may have also received these defective ear plugs. The original ear plug design was provided by Aearo Technologies which may have known as early as 2000 that the designs were flawed in various tests. 3M didn’t re-design these plugs; they simply sold them to the Department of Defense. The alleged flaw in which 3M should have seen in testing, are that they are too short to provide adequate protection. So if a service member can’t insert the ear plugs fully then they simply don’t work. Other service members reportedly said some of the ear plus could not maintain a tight seal and that loud sounds would routinely come through the plugs. Reported injuries from 3M ear plugs service people are facing. 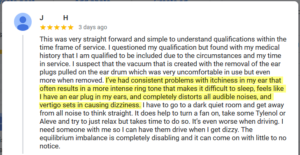 Many of the phone calls we’ve been getting from vets claiming to be hurt are now suffering from a condition known as tinnitus, a ringing in the ears. Others complain of dizziness and others from substantial or total hearing loss. This is unacceptable in our view. We and other law firms have already started the lawsuit process in order to hold 3M liable for lack of testing and lack of proper warning. Here is one veteran’s statement made to us in a review: We have deleted his name for privacy. It was the Defense Logistics Agency that took action against 3M for providing these faulty combat ear plugs. 3M now has to pay a large $9.1 million dollar fine brought to light by a 3M employee who went public with internal ear plug testing information. How many 3M ear plug lawsuits are there? It’s difficult to say exactly how many service members have been affected by these combat ear plugs. We do know that they were widely used from 2003 to possibly longer than 2015. Based on our phone calls from vets, lawsuits could be in the thousands. We certainly hope that not the case, but we may be hearing from many more now that the mainstream news services are picking up the story. National Injury Help is now accepting these 3M ear plug hearing loss cases. If you or someone you know have suffered partial or full hearing loss or have tinnitus, contact us today for a free case review. You may be eligible for cash compensation from claims and settlements from this military ear plugs lawsuit. Use the contact form on this page, or call us direct at 1-800-214-1010.